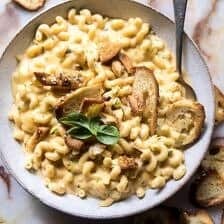 The Cheese-Maker’s Mac and Cheese. 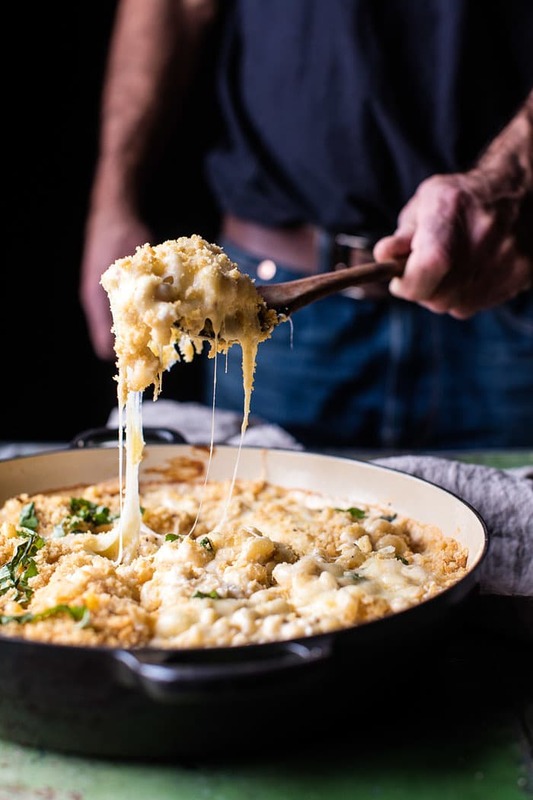 Sharing my favorite family dinner today, The Cheese-Maker’s Mac and Cheese from The Half Baked Harvest Cookbook. Reprinted from Half Baked Harvest Cookbook Recipe from My Barns in the Mountains. 1. Preheat the oven to 350°F. Spray a 9 x 13-inch baking dish with cooking spray. 2. In a large saucepan, melt 4 tablespoons of the butter over medium heat. Whisk in the flour. Reduce the heat to medium-low and cook for 1 minute, stirring once to avoid burning—it will bubble. Gradually whisk in the milk and 2 cups of water, then stir in the macaroni. Increase the heat to medium-high and bring the mixture to a boil. Stir frequently until the macaroni is just al dente, 8 to 10 minutes. 3. Meanwhile, in a medium skillet, melt the remaining 3 tablespoons of butter over medium-low heat. Add the garlic and cook for 30 seconds, or until fragrant. Add the crushed crackers and toss to coat. Toast the crumbs until browned, stirring frequently to avoid burning, for 3 to 5 minutes. Remove the pan from the heat and set aside. 4. 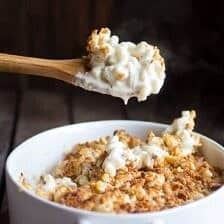 When the macaroni is al dente, remove the pan from the heat and stir in the cream cheese, cheddar, fontina, Havarti, Gouda, and cayenne and season with salt and pepper. Stir until the cheeses have fully melted. Transfer the mixture to the prepared baking dish. 5. 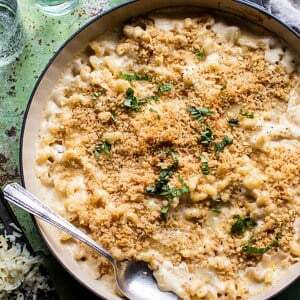 Evenly sprinkle the toasted cracker crumbs over the mac and cheese and place the baking dish on a baking sheet. Bake for 15 to 20 minutes, or until the crumbs are golden brown and the sauce is bubbling. Remove from the oven and let sit for 5 minutes (yeah, right). Garnish with fresh basil. Dig in! 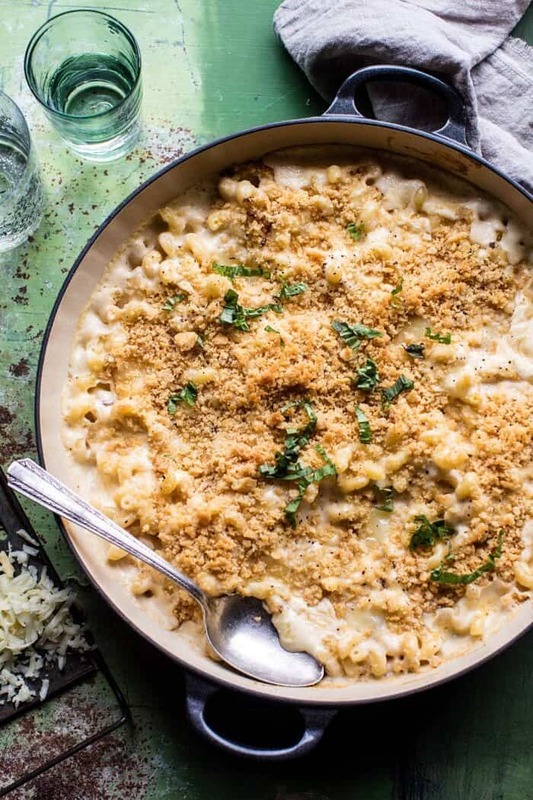 Sneaky Zucchini Mac and Cheese with Everything Bagel Chip Crumbs. Should you drain the remaining liquid after boiling the macaroni or leave it before adding the cheese? This looks so good! 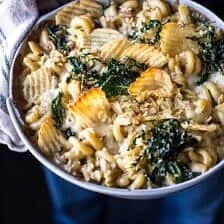 Sounds so yummy – I am super excited to serve this up at my mac and cheese obsessed 3 year old’s birthday party! However, I would like to prepare this the day or night before the party. Would you still bake it and then reheat it by baking it again the following day? 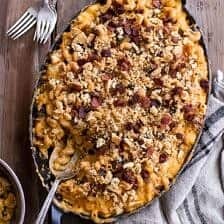 I know that it is famous, but believe in me, I have never eaten mac and cheese, but i would like to try some day. Wow I hope you love this Leo! Thank you so much! Hi! Do you recommend using a Dutch oven for this? I’m just unsure the Best saucepan to use. The cracker topping on this is next level! I used a garlic paste to get a more consistent flavor throughout. I’m a lazy chopper. I made this last night and it was the best macaroni and cheese I have ever had. I substituted toasted Panko breadcrumbs instead of Ritz crackers. I used my Dutch Oven for everything but the breadcrumbs. The outcome was phenomenal. Great job on the recipe. Delicious! I was super skeptical about cooking the pasta in the milk+roux base, but especially since I went all in on using my Le Creuset Dutch Oven as a one-pot meal from stove to oven, it definitely made things easier than separately boiling the noodles! I also used “cresto de gallo” noodles, which before I carefully read the name I was thinking looked like a macaroni/dragon hybrid! Thank you so much Sarah! I am so glad you loved this recipe! Hi, I have some leftover havarti, Gouda, and white cheddar from a cheese board I made this weekend. Found this recipe as a perfect way to use up the rest of it for a thanksgiving side! Could I add a little more of each of those 3 cheeses as a substitute to the fontina or is that critical to add? Thanks!